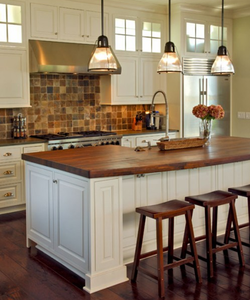 One of the most popular and desired features to add to a kitchen during a remodel is an island. Even if the original kitchen has an island, many homeowners want to move or upgrade it. This leads to natural questions about the optimal kitchen island placement when you’re installing new kitchen cabinets. The first thing that’s going to determine the placement of your island is the width of the “work aisle,” or the space between the island and other countertops and kitchen work surfaces. According to the National Kitchen & Bath Association, for a single cook, you need at least 42”. For multiple cooks, it is 48”. This seems like a lot, so why is it so much? Well, the doors of most ovens and dishwashers open to between 24” and 30” with the most common measurement being 25”. Both spacings also give enough room to open most cabinet doors across from an open appliance, but clearance for walking also needs to be considered. A 42” work aisle means a single cook can walk through the space between an open appliance door and a counter safely, without much risk of falling onto the open oven door. For two cooks, 48” gives enough space for them to cross one another side by side without knocking things out of each other’s hands. Consider who will be using your kitchen. If it’s a smaller kitchen, and one person generally does the cooking, 42” is fine. If it’s larger though, or if you cook as a family, or have parties often, the larger 48” space is the safer bet. So on your floor plan, block out 42” or 48” from the edge of every countertop, as well as from any wall with no cabinets on it. (Hint: This is easy to lay out and measure in our DIY online kitchen design tool). That will give you the real dimensions you have available for an island. The other primary concern in placing a kitchen island, and more specifically the appliances and elements, involves making sure no appliance doors collide or interfere with each other. To do this, on a paper floor plan (our design tool’s floorplans are easy to print), draw the open rectangle of the oven and dishwasher door and the opening arc of the fridge door. Keep in mind, most refrigerator doors open beyond 90° to at least 120°, so don’t stop straight out from one edge of the fridge. If you have at least 42” (or 48”) of clearance between any two counters and/or open walls, and none of your appliance doors collide, congratulations! You have a functional arrangement for your new kitchen island! But wait, “functional” and “optimal” aren’t the same thing, you might be thinking, and that’s true. Truly optimal layout is different for every single kitchen, and the theory and best practices behind kitchen design are a viable career option, and way beyond the scope of this blog entry. That’s why we have professional kitchen design consultants on call, available to our customers to assist with kitchen design questions and concerns. To schedule a free consultation (a $500 value!) visit https://www.rtacabinetstore.com/free-kitchen-design-help or call 1 (610) 337-5934. We look forward to hearing from you!